Do Vegetarians And Vegans Think They Are Better Than Everyone Else? : 13.7: Cosmos And Culture Vegetarians and vegans don't eat meat. They do often have ethical concerns over how animals are treated by meat eaters. So do they think they're better than everyone else? Commentator Barbara J. King puts this question to two prominent non-meat-eaters. Do Vegetarians And Vegans Think They Are Better Than Everyone Else? Torture or tasty tradition? Many consider the consumption of meat to be a question of ethics. 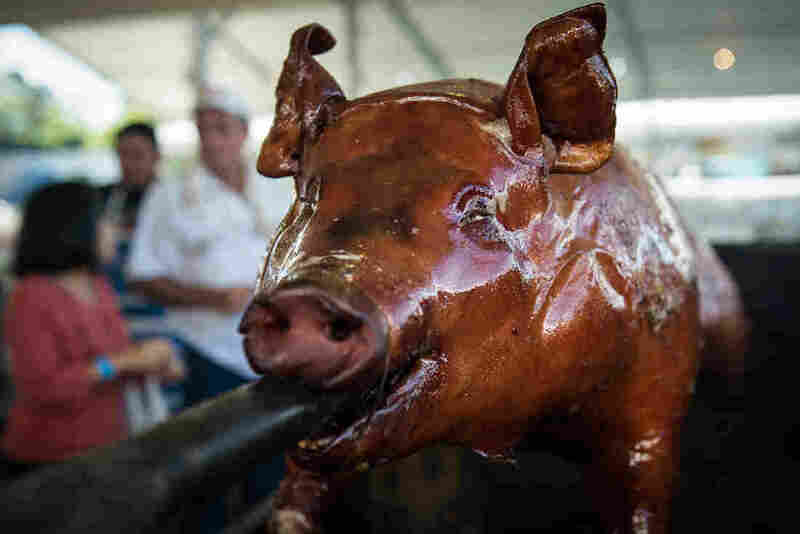 Here, a pig is roasted during the annual Festa Junina in Guarulhos, a suburb of Sao Paulo, Brazil. Do vegetarians and vegans think they are better than the rest of us? Judging from personal experience, a good number of people who aren't vegetarian or vegan would offer a resounding "Yes" to this question. When I wrote about the paleo-diet, a reader commented: "You are one more in a long line of vegetarian holier than thou types." When I considered vegetarian diets from an evolutionary perspective, a reader mocked, "Airy, fairy self- righteous, I am more virtuous than thou..." Another wrote to say, "The worst thing about vegetarians and vegans is that treat it like a religion. They preach, they push, and they act like they are better than the rest of us." And these are just three examples. So is it true? Do vegetarians and vegans think they're better than everyone else? "Everyone knows that there are saintly meat-eaters and cruel vegetarians. Also, almost all current vegetarians (in Western countries at least) spent much or most of our lives eating meat. So no, vegetarians don't think we're better than everyone else." "However, we do think that people who care about animals shouldn't be paying other people to slice animals' throats open so that we can eat their corpses. On this issue specifically, vegetarians do think we're more consistent than meat-eaters, most of whom claim to care about animals, and yet routinely pay others to abuse and kill them for a product (meat) that isn't necessary. But of course, diet is just one from among many ethical issues." "I think most people agree that not committing violence against another – human or nonhuman - is an ethically superior position to hurting someone. For me, I reflect this ethic by being vegan. Contrary to what some people think, being vegan is not an end in itself; it's the means to an end. It's the means through which we can – in our daily lives – reflect our value of not causing harm." "The truth is I feel humbled being vegan rather than superior to those who aren't. I have no cause to be self-righteous. There was a time when I ate animals and made excuses, and I feel grateful to be armed with knowledge and awareness and to be able to act on my values of compassion and kindness. Rather than feel morally superior to people who eat animals, I feel great sorrow for the animals who suffer and for the humans who inflict that suffering. If we keep this big picture in mind, we can create the compassionate world we all envision." In answering my question in the negative, Friedrich and Patrick-Goudreau both point to their own meat-eating past. But they do strongly exhort others, through "should"-type speech, to choose certain diets over others: diets that don't involve doing violent harm to animals. I understand this. Both work towards a more compassionate world for animals; their goals are just not compatible with an all-embracing "live and let live" approach, as if one set of food choices were just as okay as another. It's clear to me that Friedrich and Patrick-Goudreau believe not that they are better people than meat-eaters, but instead that their dietary practices are better for animals, and for our world as a whole, than the habits of meat-eaters. Why do many people so readily confuse these two things?